Do the plugs light up? 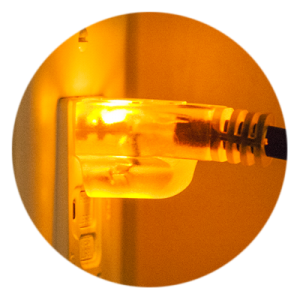 The plug-in heads of our Heat Tape Pro Ice dam Heat tape are lit via an LED when it is plugged in. This pretty cool when you want to see if your heat cable is plugged in and working. Just glance out at the outlet and see if you see the light. Even better: when used in conjunction with a ThermoCube, you will be able to see if your heat tape is currently active and heating.